Yesterday, after a fourtnight of sitting on the sofa drinking coffee and eating cookies, I suddently arose and started some serious decluttering. I mean SERIOUS. The woman behind this beautiful room is Kelly McGuill. Check out her blog O so D.
It's so clean and fresh and calm. 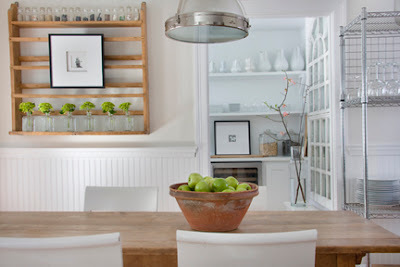 So, this pic got me going - I want my home to look clean and fresh and calm!!! My goal? Finish the upstairs today! P.S. Want to know my new years resolutions??? But I have a goal: to grow in grace. And thank you for an AWESOME blog....you know that picture you can't get out of your head? Yeah, there are a few choice pictures on HERE that I can't get out of MY head! :) I am so inspired by you; thank you for sharing yourself and your beautiful home with friends and lurkers alike. delightful blog...love your decorating philosophy...made me cry...blessings this new year. Don't you just love the images of Kelly's home? I've been in a cleaning frenzy over here. I've sold a bunch of stuff on craigslist and changing some bedroom stuff around. Feels good!!! I enjoy your blog! It's lovely. And I share your goal!